We turn our evidence-based breakdown of the Jets with the Jets’ former young forward, Evander Kane. 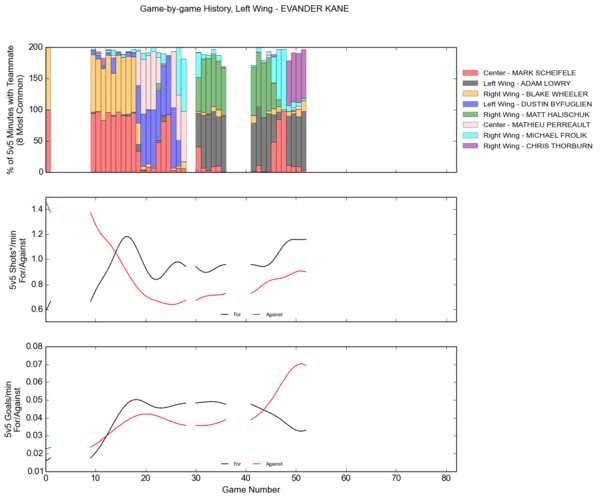 Evander Kane had his worst offensive season as a Jet, although it was not that bad. Kane’s fourth season as a Jet saw him pacing for a 22 goals and 26 assists season. While Drew Stafford had all the signs of unsustainably high scoring, Kane carried all the same but for unsustainably low scoring. Kane shot below his standard shooting percentage. Mostly it was for even strength situations, where Kane scored on two-thirds as many shots as he normally produces. Some of this could be puck-bounces, and some of it could have been his shoulder injury that derailed his season. Kane’s linemates scored at a slightly lower rate, but the biggest change was in his IAP. IAP (individual assist percentage) is the percentage of team goals while a player is on the ice that the player picks up an assist on. These numbers have been shown to regress to the player’s career mean much like shooting percentage does. The worst was at even strength. Kane normally assists on 52 percent of the non-Kane Jet/Thrasher goals scored while he’s on the ice, and has never before dipped below 50 percent. This season though Kane only assisted on 26 percent, half his normal pace. Implementing the same process as we used for Stafford previously, we estimate that Kane should have scored 11-12 goals and 15-17 assists. This may not seem like a drastic change, but a little bit means a lot when it comes to scoring. This places Kane at a 25 goal and 35 assists over an 82 game game pace. Some try to rebuttal these percentage adjustments stating Kane’s play style promotes low percentages. True or not, it would be irrelevant, since we are comparing Kane to how Kane performed previously, when he has always received complaints by some on that. In fact, Kane actually improved in WAR-on-Ice’s scoring chances, both on ice and individual, suggesting that Kane was doing the work that –more often than not– should have a positive effect on his percentages. There were some calling Kane the a third line winger due to him playing on the Jets third line at seasons end. Paul Maurice thought otherwise though. Kane was Maurice’s second choice for even strength situations while playing on the second power play unit and a healthy dose of penalty kill. Interestingly Kane was used in a defensive role, given a large share of the Jets defensive zone starts. Kane saw similar proportion relative to what was available to Mark Scheifele, Drew Stafford, Jiri Tlusty, and Mathieu Perreault. However, Kane had the Jets toughest ration of defensive zone starts relative to his own offensive zone starts. 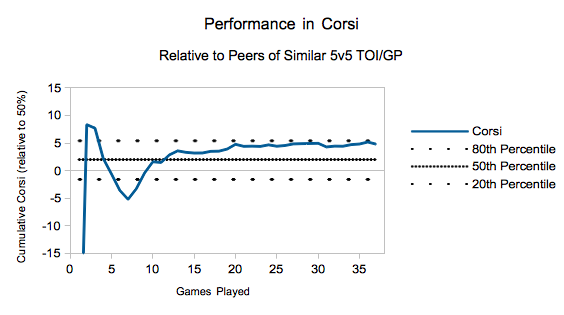 Kane faced slightly above average competition levels while also playing with middle tier linemates and defenders. Kane played first line minutes, and so he gets compared to first line players. As we see here, in terms of shot attempts, Kane carried the play into the other team’s zone at a high level. All the more impressive given the injury and his 47 percent offensive zone starts. For centres, Evander Kane predominately played with Mark Scheifele and Adam Lowry. This could play in part to Kane’s low percentages. While both Lowry and Scheifele performed well this season in terms of two-way numbers, Scheifele paced at even strength scoring like a third line player, while Lowry was comparable to a fourth line player. A save percentage tailspin near the end (where Ondrej Pavelec and Michael Hutchinson were nose diving at the time) looks to play role in Kane’s second turn on the third line. It’s too bad Kane did not play with Mathieu Perreault more. Prior to season’s start, it was noted that the two looked analytically compatible. For the minutes that the two played together, the Jets carried a 60 percent Corsi rating and outscored their opponents at a 2:1 pace. Kane did not score very well, as we noted earlier in the article. He did however perform well in the two way numbers. Kane held the Jets 6th best shot attempt differential. Some have claimed that Corsi inflates Kane’s value “due to his shot selection style and not being able to use his linemates” yet scoring chances say the opposite, with Kane ranking 5th on the Jets there. Kane’s relative numbers are a bit lower than his raw numbers, as Kane had the benefit of not playing early in the season when the team was at it’s worst. Goals above threshold indicates Kane did not move the Jets goal differential much one way over the other. Part of this has to do with his percentages, but most of it is due to his tendency to be penalized hurting his value and lower number of games played limiting impact. Evander Kane is a good player and his contributions towards winning games will be missed on the ice. He has always performed as a “machine gun” type rather than the “sniper” fans wanted him to be. While it is only anecdotal perception, there seems to be a relationship in fan perception of value with two different factors: performance in percentages (variance) and style of play. In regards to the later –when it comes to controversial players like Dustin Byfuglien, Tobias Enstrom, Evander Kane, and others– it seems that many vocal individuals prefer how one gets to the destination rather than whether they actually get there or not. Despite his on-ice value being worthwhile, Kane and the Jets were likely not destined for any further future. He was out for injury for the remainder of the season when the Jets needed all the help they could get. In addition, when he was to return, the dynamic of the room was in question. The Jets gained some interesting value in return for him. If one is to view Tyler Myers and Zach Bogosian as a swap, then the return for Kane was a rental (Drew Stafford), two B prospects (Joel Armia and Brendan Lemieux), and a late first round pick (2015’s 25th overall). All things considering, Kevin Cheveldayoff got quite the return for a player that was questionable to ever play a game as a Jet again. Short term, Stafford’s acquisition went well; Stafford had some percentages play in his favour and likely gave more value than what his true performance should normally give. The long term still remains a question. Joel Armia has performed well in the AHL but is still not quite there. Brendan Lemieux has scored well in the OHL, but predominately sits on a third line role on a deep team. The late first round pick has less than 50 percent chance of making 200 games played. Either way it will be interesting to see from a distance how he performs in Buffalo in the future. No heart. Never was going to work out in Winnipeg in the long run. 100% dead after tracksuitgate. Chevy got a good, if not great, payment from Buffalo for a broken player who was done for the season. Based on that, it will always be a win even if Kane does score 40 goals in a couple of seasons. Even if he’s a 25 G guy, it *could* end up a win for Buffalo in a strict on-ice value. The one thing I’ll never agree with is Kane having no heart. That guy was one of the few to give 110% game in, game out. His team-mates didn’t agree apparently. But, yes, I would agree that 2 or 3 25 goal seasons would be a good value for Buffalo. What I meant was that even if he scores 40 goals, it would have never happened in Winnipeg because of the circumstances. An irreversible rift occurred. We don’t know what his teammates truly believed. I’m not sure and doubtful they questioned his on-ice performance or effort.